A minister, wearing his clerical robes and holding a prayer book, poses for his portrait at the A. R. Fowler studio in Meadville, Pennsylvania. The clergyman displays quite a stern appearance in this image. His congregation must have heard some fire and brimstone sermons from this cleric. To view other photographs by A. R. Fowler, and to learn more about him, click on the category “Photographer Fowler (A. R.). 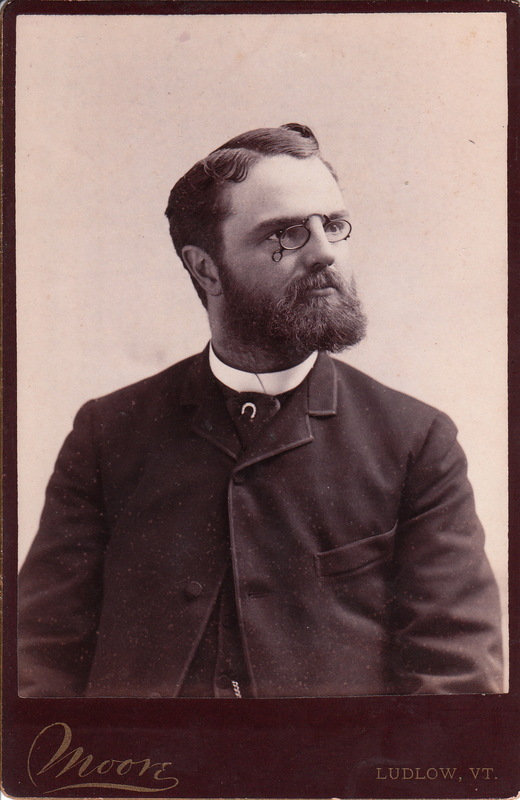 A clergyman is featured in this cabinet card portrait from a photographer named Moore in Ludlow, Vermont. The man has an educated appearance emanating from his beard and pince-nez spectacles.Pince-nez are a style of spectacles that was popular in the nineteenth century. These glasses were not supported by ear pieces but instead, stayed on the wearer by pinching on the bridge of his or her nose. The clergyman is wearing a pin near his collar and part of the chain from his pocket watch is visible at the bottom of the image. The Photographic Journal of America (1890) mentions photographer, C. A. Moore of Ludlow, Vermont. He is likely the same Moore that created this image.